[A] long overdue retrospective of the major playwrights, theatre companies, and professional organizations which have sustained the children's theatre movement in this country...Part One of McCaslin's book is a historical overview of the significant trends and changes which have characterized children's theatre and influenced the art and craft of playwriting...Part Two, the bulk of McCaslin's guide, contains an alphabetical listing of over 350 educational, community, and commercial theatre companies as wella s national and regional organizations--some no longer operating--which have made children's theatre the main thrust of their work...Several appendixes augment the usefulness of this altogether practical and meticulously researched reference book. Children's Literature Association Quarterly An authoritative reference for children's theater professionals, educators, and enthusiasts, McCaslin's historical guide will be frequently used in public, college, and university libraries. 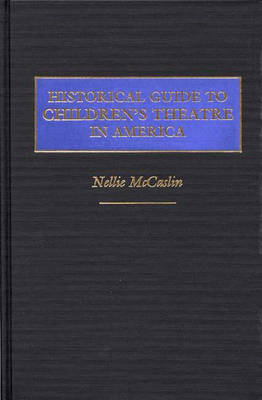 ARBA Those who are associated with children's theater in any way will want to study this book thoroughly and keep it as a handy reference guide...Thanks to Nellie McCaslin, the history of children's theater can take its rightful place beside all other theater history. Applause Professor McCaslin, a leading authority in the field, examines the history of the companies and organizations that struggled to bring live theatrical entertainment to children from 1903, beginning with a theater founded by a settlement house on New York's Lower East Side, to the present day. She begins with an overview of children's theatre history. The main text consists of alphabetically arranged profiles of both early and current producing companies and associations that have made a significant contribution to the field. Appendixes to the volume supply a Personalities Roster, a Geographical Index, and a Chronology of Events significant in the history of the children's theatre movement.